The All-Analytics team returns. Like always, the awards are predominantly based on pure numbers, specifically Win Probability Added and Expected Points Added. The chart at the bottom of this post is provided for easy reference. It plots regular season WPA and EPA for the top 32 players at each position. You can look at past seasons as well. The players closest to the top right corner are the leaders at their position. That chart is available with running totals throughout the season in the Tools | Visualizations | Position Leaders link in the menu. Without further ado, here are the 2013 awardees. Winners receive an invitation to play nerf touch football in my backyard. Airfare and hotel are not included. Click on the position headers to see the full stat table for each position. The 2013 MVP is undisputedly Peyton Manning. When arguably the best QB of the era has his best year ever, he's the MVP. He's a very distant 1st place in EPA, WPA, and SR among QBs. There isn't much to say that hasn't already been said, except perhaps that the advanced numbers confirm what everyone already knows. Offensive player of the year is also a slam dunk. It's WR Anquan Boldin. Other than Manning, no other offensive player outpaced his cohort to this degree. Boldin's numbers for 2013 were absolutely dominant. 3.12 WPA (2nd place was 2.37), 96.3 EPA (2nd place was 74.9). Boldin carried the SF offense this season. His Tgt% (an indication of getting open, or at least "Boldin-open") was 31.4%, 2nd only to Vincent Jackson at 32.3%. But Boldin's catch% was 66% vs Jackson's 49%. 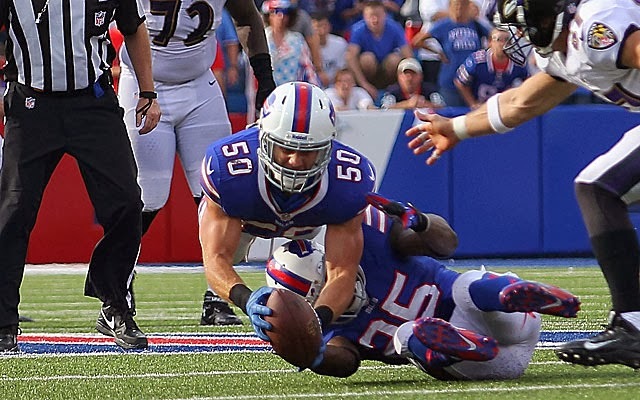 LeSean McCoy beats out Knowshon Moreno for RB of the Year. He topped the league in both EPA and WPA. McCoy and Moreno were the outliers for the position, but McCoy was the clear #1. Behind Boldin at WR, I'm going to name Calvin Johnson, who was 3rd in WPA, but only 9th in EPA. I like Johnson here because he dominated despite being the sole focus of every defense he faced. For a 3rd WR, I'd have to say Josh Gordon (4th in both EPA and WPA) beats Demaryus Thomas, DeSean Jackson, and Antonio Brown. Why? Because of who was throwing to him. By the way, who was throwing to him? Tony Gonzalez is the TE of the Year. This isn't some farewell gift. Gonzalez topped all TEs in WPA and EPA despite being on a team having an uncharacteristically losing season. And there were some very good TE performances this year--Bennet, Thomas, Graham, and more. Gonzalez, at age 37, topped them all. The Offensive Line of the Year is another easy one. Dallas. The DAL o-line allowed only 79.5 -EPA to opposing front-sevens. Second best was DEN at 49.9 -EPA, and the Broncos have a QB that gets rid of the ball at light speed. Keep in mind that the league average is exactly zero -EPA. The DAL o-line was also 2nd in WPA, and league-best in both run -EPA and pass -EPA. That tells you something. JJ Watt and Robert Quinn are the clear leaders here. 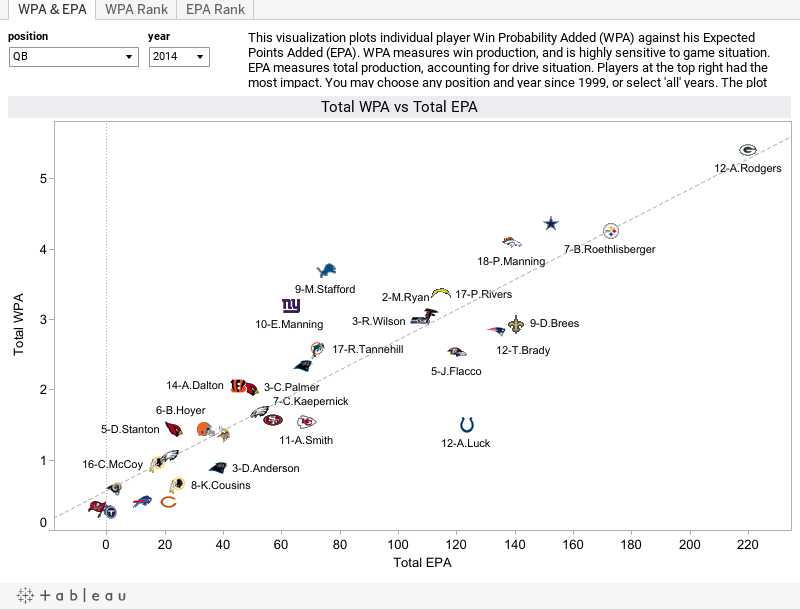 Watt, last year's All-Analytics MVP, was #1 in +WPA and 2nd in +EPA, while STL's Quinn was #1 in +EPA and #2 in +WPA. Interestingly, the two DEs right behind Quinn and Watt are both CIN DEs. Carlos Dunlap and Michael Johnson were the most fearsome pair of bookends in the NFL in a long time. I don't get the Kuechly thing. He's not the DPOY. He had a much better year in his rookie outing last year. I suppose because he's popular, he plays ILB, and CAR made the playoffs he was going to get it. But there were LBs with even better numbers. Lavonte David of TB is the top LB this season, followed by Kyle Alonso and Karlos Dansby. Then comes the rest of the pack, including guys like JAX's Posluszny, SF's Bowman, DET's DeAndre Levy and STL's Ogletree. Then comes the bigger clump of guys which includes Kuechly. Admittedly, stats like +WPA and +EPA don't work as well for CBs as they do the other positions. Trent Williams and DeAngelo Hall are the top guys by those standards. Alterraun Verner of TEN is #3. But if we look at just Success Count, which doesn't reward gambler CBs like Hall, we get LarDarius Webb, Trent Williams and CAR's Captain Munnerlyn. Maybe I'll play it safe and go with Richard Sherman and Brandon Boykin who led the league in interceptions. If I were drafting a team today I'd probably take Sherman and Webb, but that's a purely non-analytic opinion. Safeties are much easier to assess than CBs. This season the top two were KC's Eric Berry and CLE's T.J. Ward. They were well ahead of the peloton, itself led by Weddle, Polamalu, and Ihedigbo. The All-Analytics Defensive Player of the Year is LB Levonte David of TB. It was a tough decision. No defensive player stood out from the pack the way Manning and Boldin did on offense. Alonso and David had the best overall numbers of any defender, and they play a critical position. David gets it because he's got the better overall combination of +EPA and +WPA. He also edges Alonso with 107 vs 105 Success Count. Eddy Lacy? Give me a break. He had a purely average year on a popular team. 4.1 YPC. Average. 41% SR. Average. A net of 0.7 total EPA? Average. He lucked out with a bunch of TDs. But this isn't the fantasy awards, is it? Giovanni Bernard? He had a better season than Lacy, but he was well down the RB pack, and RB is a position where rookies can excel relatively easily. SD WR Keenan Allen gets the nod. He was 7th in WPA and 15 in EPA in a very deep WR field. There's a number of reasons Philip Rivers had such a resurgent year, and Allen was one of the big ones. That's an easy one: Alonso. I did not realize Boldin was that far ahead of the pack. Wow! This to be ridiculous because the journalists pick Peyton Manning MVP and they not using calculators. You spend a lot of time figuring out what the rest if us already is know that Peyton is the best. Okay, John it is pretty easy to see that Peyton was that far ahead of the pack, but did you see Boldin coming? What about Gonzalez after such a disappointing season? It's clear that nobody saw that because he didnt even make the pro bowl even though he was far and away the best TE this year. These advanced analytics are used by teams to evaluate players and they are absolutely here to stay. John, why visit an advanced stats site? maybe your Mom could start one? She know better than that. She used a call my coaches back during my career to give advice cause she do know the game. But nobody should be talking about football stats except those of us who played high level ball. I knew Eli had a bad season, but worse than EJ Manuel?